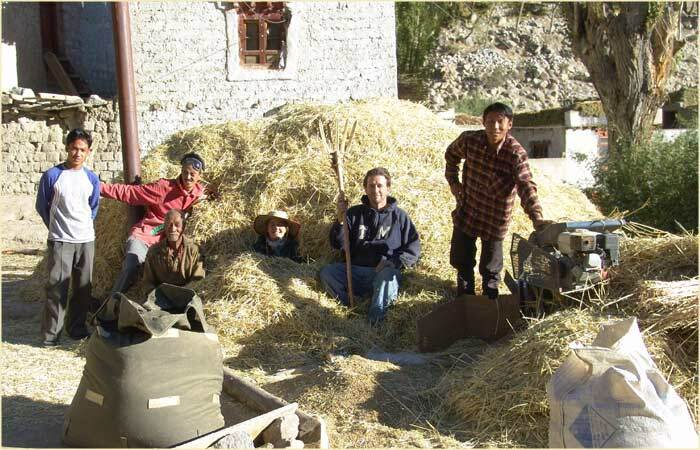 The Thresher Project provides small gasoline/kerosene powered wheat and barley threshers to villages in Ladakh that because of their remoteness have received little or no humanitarian assistance. A crop that would take 10 to 14 days to thresh using animals takes from two to three days using the thresher. 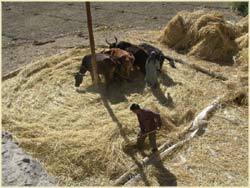 After harvest, many farmers travel to other parts of Ladakh for manual labor and the time they save using the thresher enables them to leave earlier. 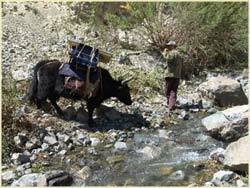 The thresher provides an alternative to villagers who do not have animals and have to rent them. Even those with animals cannot always rely on them since they get sick and sometimes die. Sanitary issues with animals defecating and urinating on the grain are avoided by using the thresher. Less grain is lost using the thresher because animal threshing does not always completely thresh the heads and some of the grain is trampled into the ground. The head Lama of one village told us that he likes the thresher because it runs on its own and they do not have to beat their animals (a sin in Buddhism) to get them to cooperate in the threshing process. The thresher thus elimates a religious obstacle that is a problem associated with traditional threshing methods. For more details on traditional Ladakhi farming and threshing, and more details on our Thresher Project, plus more videos, please visit our next page.